-This 3 days of workshops is for therapists, teachers or those of you who want to work on your own trials and tribulations. It is a sampler of methods and techniques developed by Lucia Capacchione, A.T.R., Ph.d. merged my “Art as Therapy” workshops incorporating a variety of art media. One Fri. evening & Two workshops each on Sat. and Sun. 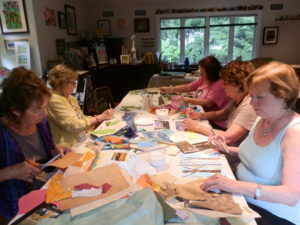 These workshops are explorations in the Creative Journal Expressive Arts techniques for journaling with art while experiencing creativity in a different way. Give your Inner Child a chance to play, so come to all or select a few. These workshops will give you the tools with which to expand your services to others and to more honestly explore your deepest feelings.